Week 14 Review: The CFL season is starting to wind down so things are starting to get a little tougher. Pipkin failed us last week so that means Manziel is going to get the start this week. Romar Morris got the start and he proved to be a very good running back play. Burnham balled out again showing his value in this BC Lions offense while Reggie Begelton is emerging in this Stampeders offense. Let’s get after it this week! Trevor Harris is the quarterback that I would pay up for this week. He draws a good matchup against the Eskimos defense who has struggled containing the pass. Just looking at the last 3 games for their defense, they have allowed 41 attempts per game (Ranked last in the CFL), 394 yards passing per game (Ranked last in the CFL) and have allowed 2 passing touchdowns per game (almost last in the CFL). Obviously, teams are recognizing this and exposing the Eskimos through the air. When Harris is on, he is one of the best pure passers in the league and I hope he takes advantage of a good matchup this week! Zach Collaros has burned me several times, but I am not afraid to try him again. He is priced way down at $8,200 and could be a good value. The problem is that Saskatchewan plays such physical defense and try to grind out games via the run, it is difficult for him to rack up the fantasy points through the air. Toronto is a team that we have been targeting all year long through the air, so I figured if there was a time to use Collaros, it would be now! Over their last 3 games, they have allowed 331 passing yards per game and over 2 passing touchdowns per game so hopefully this easy matchup could result in Collaros racking up some fantasy points for us. William Powell will be my main running back for this week. He has been on fire as of late, posting 20+ DK performances in 3 of his last 4 games. He has been seeing 17 or more touches in 4 straight games and has been getting 2+ receptions in each of those games as well. Edmonton does not do well against the run, allowing 121 yards on the ground and averaging 1 rushing touchdown over their last 3 games. I’ll be locking Powell into my lineup and moving on! I personally think Jeremiah Johnson will be more involved in this weekend’s matchup. Travis Lulay went down with an injury last game and even though Jonathan Jennings came in and played a solid game last week, I think the Lions will try to grind this game out on the ground. 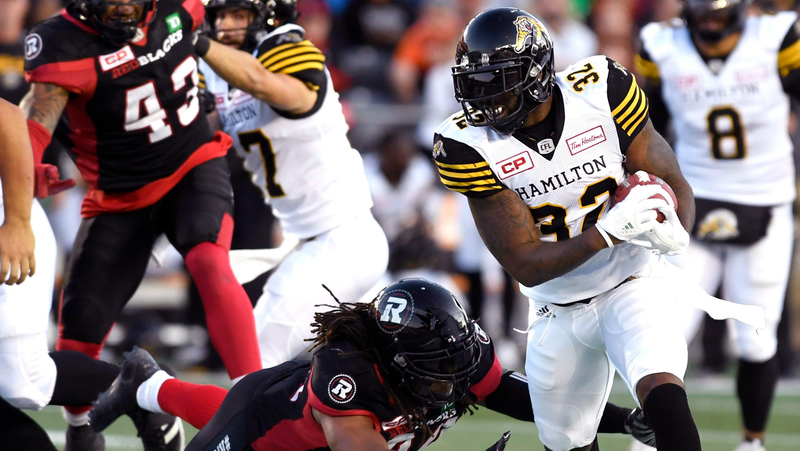 Hamilton has been stingy in terms of rushing yards allowed, only allowing 91 yards on the ground over their last 3 games, but they have giving up over 1 rushing touchdown per game in that same span. Johnson is more of a tournament play this week so make sure to grab a share if you end up making multiple lines. Anytime you see a red Q appear next to someone’s name, but they look healthy to play, you know you might get him at a little bit lower ownership. That is the case when it comes to CJ Gable! Gable was back at practice this past week and seems like he will be able to play against Ottawa this weekend. Gable has been a consistent performer when he is in the lineup and he has been able to get double digit DK points in his last 4 games. The Redblacks defense is allowing some yardage to opposing backs so this could be a game where Gable is relied on a bit more. If news comes out later on that Gable is unable to give it a go, pivot to Shaq Cooper who is only $4,700. I will be looking to pair some Ottawa receivers this week with Harris in some of my stacks. Spencer has been killing it lately from a DK fantasy standpoint, so he will be one of the better overall gpp options from this team. I also like using Greg Ellingson anytime I role out Trevor Harris in a line. He has been the most target receiver over the past 3 games so definitely look his way if you are making an Ottawa stack. If you are wanting cheap exposure to this offense, look to either RJ Harris or Dominic Rhymes who are both under 5k! I think it would be smart to run that stack back with some Edmonton receivers. Duke Williams is always in play since he is the best overall receiver in the league! The best value on the Edmonton side of the ball is Bryant Mitchell who should be popular for good reason. He is the second most targeted receiver in some of their more recent games and he is cheap. Brandon Banks has been on fire lately and I do not think he is slowing down anytime soon. He does have a red Q next to his name, so we will have to monitor his status heading into this weekend’s matchup. If Brandon Banks is out, Luke Tasker become a plug and play kind of guy. I like both receivers in this matchup and if you were wanting a lower owned play with some upside, Rashad Lawrence could be your guy. He has been getting targeted lately and his price sits at just $3,500! From the Roughriders perspective, the solid WR play will always be Naaman Roosevelt. He tends to see the steadiest number of targets on a consistent basis and he is leaned on heavily in this offense. His price is just $6,300 which I really like this week! The other SSK receiver that deserves a mention is Jordan Williams-Lambert. He can get double digit DK points for you, but I view him as a major gpp option, especially if you are making several lineups. I will be fading the WPG, MTL, TOR and BC WRs this week. Winnipeg runs the ball and the offense flows through their ground game. The only receiver that could go off is Darvin Adams, but Montreal has been stingy lately when it comes to their overall defense. Johnny Manziel is starting for Montreal, so no one has any idea who could be the main target this week for him. He has been inconsistent at times and it’s just tough to gauge who his go to guy would be. Toronto has been so bad lately and every time I tried to talk myself into using SJ Green, it failed miserably so I am just not going down that road again. BC is in a good spot, but I just don’t believe in the upside of their passing offense when Jonathan Jennings is in the game. Him and Lulay are two different styles of quarterbacks and I just think they will try to win using the rushing attack. SSK- They are facing Toronto…..enough said! Winnipeg- Only liking this matchup because Manziel has not looked good all year long and I just don’t think he has adjusted well to the CFL overall.